This year, the summer solstice arrived with a record-breaking heat wave in the U.S. East Coast. It’s only June, and we had temperatures near 100 degrees last week. It’s cooled down a bit for the weekend, but we all know the hot days of summer are definitely here to stay. You’ve probably been thinking about cold salads lately! Well, we’ve had it on our minds! 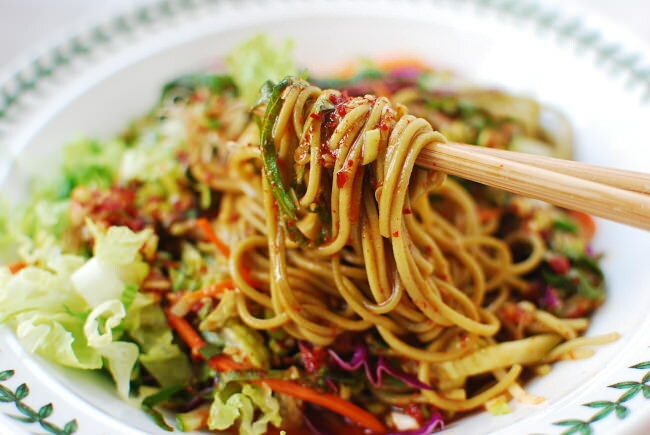 For Koreans, summer is time for cold noodles. There are so many varieties. Naengmyeon, kong guksu, bibim guksu, and dongchimi guksu to name a few. Each of these also has several variations. 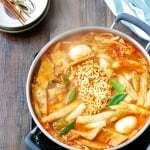 Some are made with cold broth, and others are typically dressed with a spicy sauce. Today, I made Jaengban guksu (쟁반 국수), which is a cold noodle dish served in a large platter with lots of fresh vegetables. Jaengban means a large platter/tray in Korean, and guksu means noodles. It’s usually for more than one serving and meant to be shared at the table. Each person takes a desired portion from the platter, just like taking a portion of salad from a salad bowl. 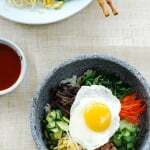 It is a type of bibim guksu, so the noodles are mixed with a tangy spicy red chili pepper sauce before eating. 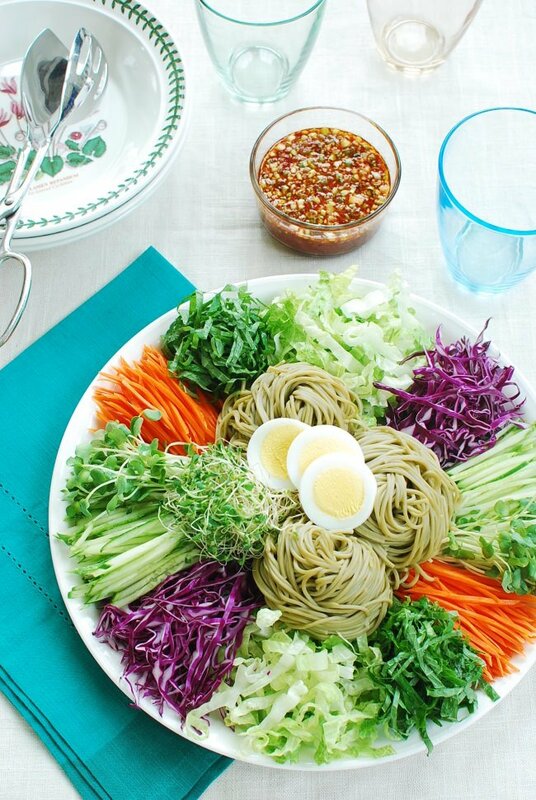 Buckwheat noodles are typical for this dish, but you can use any noodles. I used green tea noodles here. It’s common to add some cooked meat. If you have left over grilled chicken or beef, it will be a perfect addition to this dish. Shrimp would be a great addition as well. This noodle dish is also perfect as a pot luck dish or an accompanying dish to your Korean BBQ. Imagine sitting down at the table, with your family or friends, in front of this beautifully refreshing platter! It will be a nice conversation starter no matter whom you’re sharing it with! Mix all sauce ingredients and keep it cool in the fridge. Prepare the vegetables and keep them cool in the fridge or in ice water (drain well before using). Bring a medium pot of water to a boil. Cook the noodles according to the package instructions (5 – 6 minutes). Drain quickly and shock in cold water to stop cooking. Drain and rinse in icy cold water until the noodles are very cold. Make two or three mounds. Place the mounds in a colander to drain. 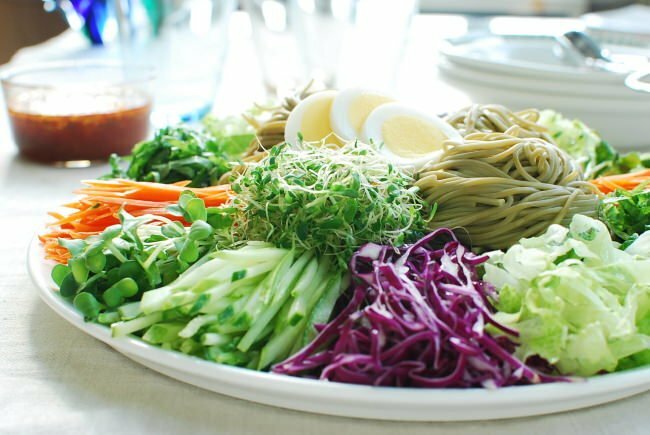 Place the noodles in the middle of a large platter, and arrange the cold vegetables nicely around the noodles. At the table, you can toss everything together with the sauce or let each person take his or her portion and then mix it with the sauce to taste. I love everything about this! It’s perfect for the warm weather that we’ve been having. I agree, and it’s perfect for the cold weather that we’ve been having too! Looks delicious! So colorful and fresh! Perfect for summer! Ah, this looks absolutely delicious! I’m in Seoul right now and heading to Busan next week–wish I could find a place that served something as fresh and healthy-looking as this! (Would you happen to have any recommendations for Seoul or Busan?) Stay cool with all the hot weather! When you go to Busan, make sure to visit Jagalchi Shijang – a big street market with lots of seafood. You’ll love it. Have a wonderful time! 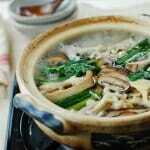 Japanese and Korean (as well as other Asian cuisines) have so many similar dishes. We have similar dishes like this (but not spicy) and I always enjoyed eating in hot humid weather in Japan. Since I came to SF, summer is rather comfortable nice warm weather and never occurred to cook this. We need some heat here to enjoy more pool time. I’m at my son’s swim camp now and it’s freezing! We can defiantly feel the heat over here too. It has been crazy hot last few days! I love your idea! Not only that this looks fresh and healthy but delicious too! I love all the colors and your presentation..very appealing and beautiful! Your photos are gorgeous, and I bet this tasted just as great as it looked. This looks so delicious and refreshing as are all your food. Love the presentation! That is just health on a plate right there! Such beautiful colours and I loved learning about the different Korean noodles out there. I love cold noodles in the summer! This dish sounds just amazing. Cold noodles sound like a great idea! This salad looks very rich in flavors and colors! I’ll admit, the first time I had cold noodles in a Korean restaurant I did find them very bizarre, but I love them now. They’re always so pretty when served and have a wonderful cooling, healthy taste too. What a beautiful, healthy dish! Perfect for the hot weather we are having now! I think that it looks so gorgeous, even those who hate vegetables (even some adults do!) couldn’t resist it. Thank you for one more recipe I will try. gorgeous! wow this looks incredible. Beautiful, fresh, and vibrant. I’d love to dig right in!! Wow! That looks great! Thanks for sharing I’ll do this with my cha soba next time. I am so glad I found your blog! 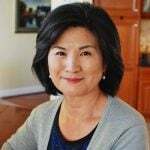 I am Korean and also have a Korean food blog! SO excited to check back and see what you have! Yummy stuff! Do you have a facebook page by chance? Is the difference between this and bibim guksu the type of noodle or the amount of vegetables used? This looks so good Hyosun, and especially that sauce…it sounds delicious I can’t wait to make it! I made this tonight for dinner and it was REALLY delicious. I love how it’s so simple and quick but tasty and healthy. I followed the sauce almost to a T but didn’t have dried mustard so I just used the regular hot mustard we get from Chinese fast food. As for vegetables I used carrots, lettuce, baby spinach, cucumbers, carrots, and mint/thai basil leaves because that’s what I had at home. YUM! I’ve made a few recipes and I have to say that everything has been easy and excellent. Thank you so much for sharing. My sister and I made this for lunch today, and I have to say it was AMAZING 🙂 I was doubtful at first because there was orange juice, but I was wrong. Thank you for the recipe! It was simple and easy enough for two 17 years old girls to make for a quick lunch! I’ve had this on my to-make list forever, and we finally had it for dinner last night. It was so easy and so so good! I was also skeptical of the orange juice in the sauce, but now that I’ve tried it I wouldn’t change a thing. We cut up zucchini, carrots, lettuce, green onion, and radishes and used soba noodles. Plus I stirfried a little chicken to toss in there as well. That’s awesome, Stephanie! I love the sweetness the orange juice adds to this sauce. Nowadays, it’s very common for Korean home cooks to use fruit juices in their cooking. Actually, Korean plum (maesil) juice is very popular as a flavoring ingredient in various dishes, but it’s not widely available in America. Orange juice works just as well in this sauce. Great to see you again! Thanks for taking the time to write me. Do you have recommendations for a non-spicy sauce that I can serve with these noodles for my kids? I love your blog btw! 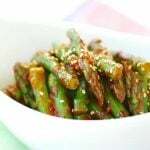 Simply omit the red chili pepper flakes and substitute dijon mustard for hot mustard. It will still be delicious! 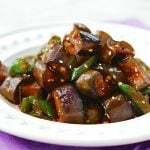 A combination of soy sauce, sugar and sesame oil is typically what Korean moms use as a sauce for noodles or rice for their little children. Hope this helps. And thank you so much for the love! Thank you for this beautiful recipe! My sister and I make this a lot. We have finally posted it on our blog. Love that its gluten-free, vegan and vegetarian. 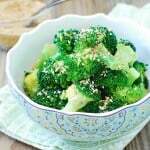 We serve it with all kinds of vegetables and people always ask us for the recipe.